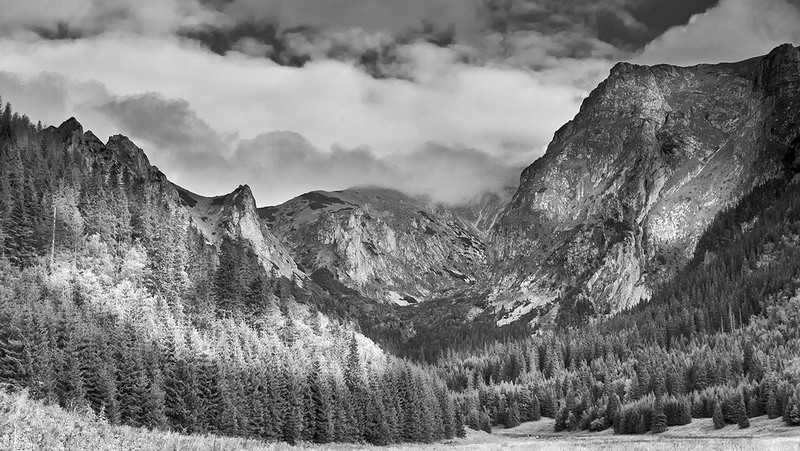 Shooting successful landscapes in black and white is not quite as easy as it might seem. I have to admit that when I first started photographing landscapes with black and white film, I was so disappointed with the results that I gave up for some 5 years. What I didn’t realise is that I was breaking one simple rule that if I had understood it, would have made life much simpler. Basically, my images lacked separation. To achieve a good black and white image you need to have separation between the elements in the frame. If you can’t distinguish or find it difficult to distinguish between the elements the image will lack impact and the viewer will struggle to understand it. The problem I had and one that many people trying to shoot black and white landscapes have is that whilst in colour the different elements are easy to see. Once converted to black and white, many of the tones of the landscape blend together. What’s needed are ways to separate the elements for the viewer. Here are some ideas to help you. The tools we now have available in the digital darkroom make life much easier. Ideally you need a conversion technique that allows you to target different colours so they appear as different tones in the final image. For example you might darken a blue sky whilst lightening grass and foliage. If you were using black and white film you would use a Green or Yellow filter to achieve this effect but tools such as Photoshop and Lightroom make this easy to achieve. This screen shot show the settings I used in Lightroom to darken blue sky whilst lightening foliage. A further tip you might like to try is selectively changing the colour for some areas of your image. This will make them respond differently during the conversion to Black and White and help provide separation. Strong composition can also help in separating the elements of the image even where they might have similar tones. One good way to ensure a good composition for black and white is to include a strong foreground interest. Seek out strong shapes in the landscape such as walls and trees that might provide a leading line into the landscape. Strong distinctive shapes are easier for the eye to pick out and understand even when the tones are similar. 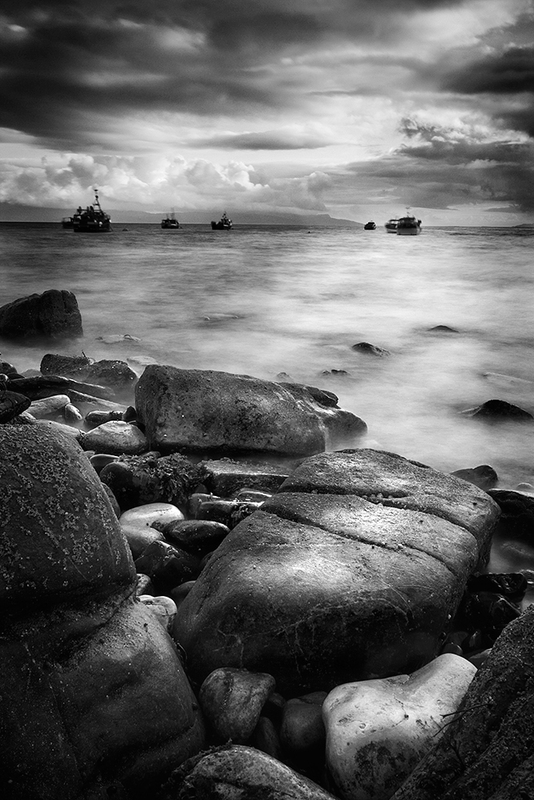 In this example I have used the strong shape of the rocks to provide a bold foreground interest. I have also used other techniques discussed below to enhance the separation of objects in the scene. 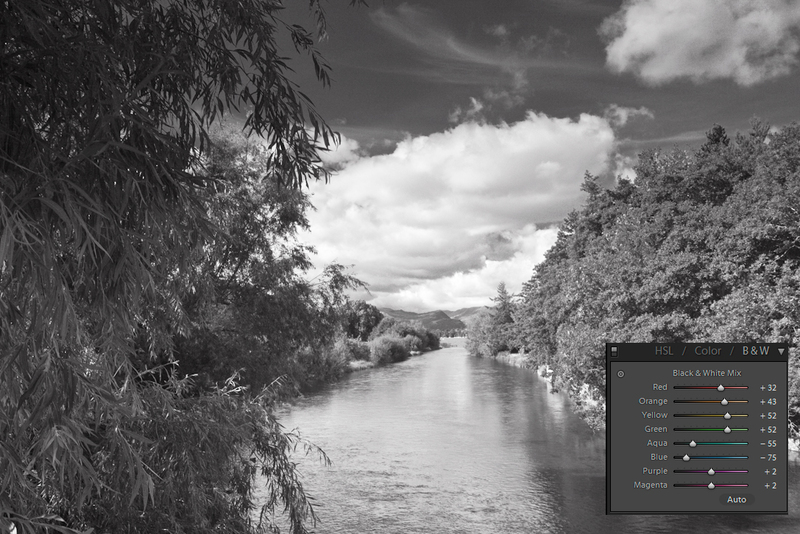 This can be a problem with many black and white landscape images. I find the elements within the frame will become much more distinct when the contrast enhanced. In the film world we would use a coloured filter such as a Yellow, Orange or Red placed in front of the lens to help boost contrast. We might also use exposure techniques and higher contrast papers when printing in the darkroom. In the digital age the easiest way to add contrast is by applying an S-Curve in your editing package. Also don’t overlook Midtone contrast as this can really add to the monochrome landscape image. The easiest way to add Midtone contrast is in RAW conversion software that has a Clarity slider, which is essentially the same thing. In the following image of the Polish Tetras I have significantly boosted the Midtone contrast to help provide some separation between the trees which would otherwise blend into a solid grey tone. The technique of dodging and burning an image has been around from the early days of photography and was used extensively by masters such as Ansel Adams. In this image I have created a conversion that deliberately darkened the ground to create a contrast with the waterfall. I then used the dodge and burn tools in Photoshop to emphasis this as well as lightening selected areas of grass. When you dodge and burn an image it helps to create the feeling of interest in the scene for the viewer. So remember the rule; if you want to capture strong black and white landscapes you need to separate the elements in the frame.